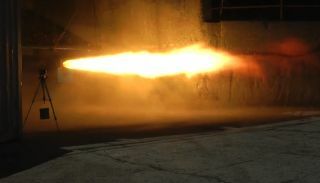 The Space Propulsion Group, Inc. successfully test-fired a 22-inch hybrid rocket motor on June 29, 2012. The motor uses liquid oxygen and paraffin as propellants. A new hybrid rocket motor fired up Friday (June 29), demonstrating technology that its builders say could lead to efficient, alternative-fuel launch vehicles down the road. California-based Space Propulsion Group, Inc. (SPG) test-fired the 22-inch-wide (56-centimeter) liquid oxygen/paraffin motor for about 20 seconds Friday, blasting a streak of bright flame into the air at the company's testing facility in Butte, Mont. The trial was the fifth for this particular motor, SPG officials said, and it demonstrated a flight-weight version of the design. The company says future propulsion systems using the motor's hybrid technology have the potential to be five to 10 times cheaper than existing rockets. And the paraffin fuel has the added benefit of being non-toxic, officials said. "We believe propulsion drives the cost of access to space and that complexity generally drives propulsion system cost," SPG president and chief technical officer Arif Karabeyoglu said in a statement after the test-fire. "By using a commercially available paraffin-based fuel, we have created an economically viable alternative that could significantly reduce the price of space accessibility, as well as help preserve the environment." Hybrid rocket motors use propellants that are in two different states of matter, as opposed to purely liquid or solid rockets. Hybrid rockets are playing a large role in the burgeoning private spaceflight industry. Virgin Galactic's suborbital SpaceShipTwo vehicle employs hybrid motors, as does Sierra Nevada's Dream Chaser, a mini-shuttle that's in the running to transport NASA astronauts to and from the International Space Station.